Preparative HPLC refers to the process of isolationand purification of compounds. Important is the degree of solute purity and the throughput, which is the amount of compound produced per unit time. · Preparative HPLC refers to the process of isolationand purification of compounds. Important is the degree of solute purity and the throughput, which is the amount of compound produced per unit time. This differs from analytical HPLC, where the focus is to obtain informationabout the sample compound. The information that can be obtained includes identification, quantification, and resolu-tion of a compound. · Chemical Separations can be accomplished using HPLCby utilising the fact that certain compounds have different migration rates given a particular column and mobile phase. 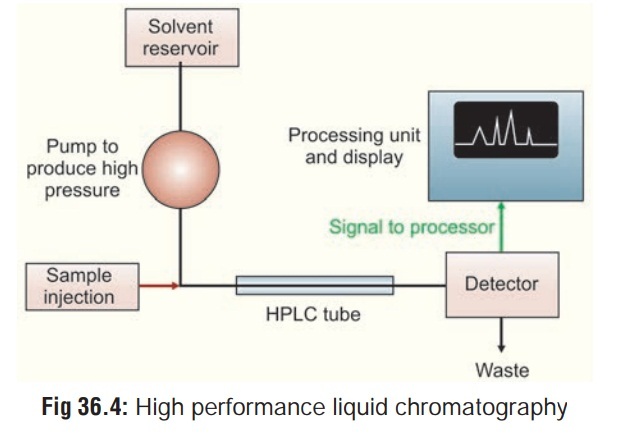 Thus, the chromatographer can separate compounds from each other using HPLC; the extent or degree of separation is mostly determined by the choice of stationary phase and mobile phase. · Purification refers to the process of separating or extractingthe target compound from other (possibly structurally related) compounds or contaminants. Each compound should have a characteristic peak under certain chromatographic conditions. Depending on what needs to be separated and how closely related the samples are, the chromatographer may choose the conditions, such as the proper mobile phase, to allow adequate separation in order to collect or extract the desired compound as it elutes from the stationary phase. The migration of the compounds and contaminants through the column need to differ enough so that the pure desired compound can be collected or extracted without incurring any other undesired compound. · Identification of compounds by HPLC is a crucial partof any HPLC assay. In order to identify any compound by HPLC a detector must first be selected. Once the detector is selected and is set to optimal detection settings, a separa-tion assay must be developed. The parameters of this assay should be such that a clean peak of the known sample is observed from the chromatograph. The identifying peak should have a reasonable retention time and should be well separated from extraneous peaks at the detection levels which the assay will be performed. To alter the retention time of a compound, several parameters can be manipulated. The first is the choice of column, another is the choice of mobile phase, and last is the choice in flow rate. Identifying a compound by HPLC is accomplished by researching the literature and by trial and error. A sample of a known compound must be utilised in order to assure identification of the unknown compound. Identification of compounds can be assured by combining two or more detection methods. · Quantification of compounds by HPLC is the process ofdetermining the unknown concentration of a compound in a known solution. It involves injecting a series of known concentrations of the standard compound solution onto the HPLC for detection. The chromatograph of these known concentrations will give a series of peaks that correlate to the concentration of the compound injected. This is usually combined with gas chromatography (GC-MS), and is considered to be the best technique for quantitative analysis of a wide variety of chemicals, but its expense (capital as well as operational costs) greatly restricts its use. In the simplest terms the GC-MS instrument represents a device that separates chemical mixtures (the GC component) and a very sensitive detector (the MS component) with a data collector (the computer component). Once the sample solution is introduced into the GC inlet it is vapourised immediately because of the high temperature (250°C) and swept onto the column by the carrier gas (usually helium). The sample flows through the column experiencing the normal separa-tion processes. As the various sample components emerge from the column opening, they flow into the capillary column interface (Fig 36.5). This device is the connection between the GC column and the MS. Some interfaces are separators and concentrate the sample via removal of the helium carrier. The sample then enters the ionisation chamber. Two potential methods exist for ion production. The most frequently used method for toxicological purposes is electron impact (EI). The occasionally used alternative is chemical ioni-sation (CI). For electron impact ionisation a collimated beam of electrons impact the sample molecules causing the loss of an electron from the molecule. A molecule with one electron missing is represented by M+ and is called the molecular ion (or parent ion). When the resulting peak from this ion is seen in a mass spectrum, it gives the molecular weight of the compound. Chemical ionisation begins with ionisation of methane (or other gas), creating a radical which in turn will impact the sample molecule to produce MH+ molecular ions. Some of the molecular ions fragment into smaller daughter ions and neutral fragments. Both positive and negative ions are formed but only positively charged species will be detected. Less fragmentation occurs with CI than with EI, hence CI yields less information about the detailed structure of a molecule, but does yield the molecular ion; sometimes the molecular ion cannot be detected by the EI method, hence the two methods complement one another. Once ionised, a small positive potential is used to repel the positive ions out of the ionisation chamber. The next component is a mass analyser (filter), which sepa-rates the positively charged particles according to their mass. Several types of separating techniques exist; quadrupole filters, ion traps, magnetic deflection, time-of-flight, radio frequency, cyclotron resonance and focusing to name a few. The most common are quadrupoles and ion traps. After the ions are separated according to their masses, they enter a detector and then on to an amplifier to boost the signal. The detector sends information to the computer which acts as a “clearing house”. It records all the data produced, converts the electrical impulses into visual displays and hard copy displays. The computer also drives the mass spectrometer. Identification of a compound based on it’s mass spectrum relies on the fact that every compound has a unique frag-mentation pattern. Even isomers can be differentiated by the experienced operator. Generally, more information is gener-ated than could possibly be used. A library of known mass spectra which may be several thousand compounds in size is stored on the computer and may be searched using computer algorithms to assist the analyst in identifying the unknown. It is important to incorporate all other available structural informa-tion (chemical, spectral, sample history) into the interpretation wherever appropriate. It is a slow and expensive method of detecting drugs in the blood, but is highly accurate. It involves mixing known quanti-ties of drug specific antibody with known amount of radioac-tively labelled drug which allows analysis of the precipitate with a gamma counter. The amount of emittance inversely correlates with the presence of assayed drug. This test is excel-lent for detection of drugs in extremely low blood concentrations (cannabis, digoxin, LSD, paraquat, etc.). Principle: In radioimmunoassay (RIA), a fixed concen-tration of labelled tracer antigen is incubated with a constant amount of antiserum such that the concentration of antigen binding sites on the antibody is limiting, for example, only 50% of the total tracer concentration may be bound by antibody. If unlabelled antigen is added to this system, there is competi-tion between labelled tracer and unlabelled antigen for the limited and constant number of binding sites on the antibody, and thus the amount of tracer bound to antibody will decrease as the concentration of unlabelled antigen increases. This can be measured after separating antibody-bound from free tracer and counting either the bound fraction, the free fraction or both. A calibration or standard curve is set up with increasing amounts of known antigen, and from this curve the amount of antigen in the unknown samples can be calculated. Thus the four basic necessities for a radioimmunoassay system are an antiserum to the compound to be measured, the availability of a radioactively labelled form of the compound, a method whereby antibody-bound tracer can be separated from unbound tracer, and a standard unlabelled material. Radioimmunoassay is widely-used because of its great sensitivity. Using antibodies of high affinity ( K0 = 108–1011M−1), it is possible to detect a few picograms (10−12gm) ofantigen in the tube. This is a fast, expensive method with good accuracy, which works on the principle that the amount of drug present is proportional to the inhibition of an enzyme-substrate reaction. A known quantity of a drug is labelled by chemical attachment to an enzyme. Drug specific antibodies added to the specimen bind the drug-enzyme complex thereby reducing enzyme activity. Free drug in the specimen competes with enzyme labelled drug and limits the antibody-induced enzyme inactivation. Enzyme activity correlates with drug concentration in the specimen as measured by absorbance change resulting from the enzyme catalytic action on a substrate. Enzyme mediated immunoassay technique (EMIT) is preferred over other radioimmunoassay methods in the emergency situation because of its simplicity and speed in providing information on toxic drug concentrations (approxi-mately one sample per minute). It eliminates the complex separation phase necessary in RIA. There are two types : EMIT-st (single test) which consists of a compact spectro-photometer for small laboratories, and EMIT-dau(drugs ofabuse) for larger hospitals. · Negative result does not exclude the ingestion of a drug that may be present in undetectable quantities. · Antibody cross-reactions can produce false positive results. This is the best method for detecting inorganic elements (arsenic, lead, mercury, thallium, etc.). However it requires a large sample of blood for accurate analysis. The blood sample is introduced into a high temperature oxyacetylene flamesituated in the path of a beam of radiation. The organic matrix is combusted and the metal forms a cloud of atoms which absorbs a fraction of the radiation in proportion to the concen-tration of metal in the sample. Light of a suitable wavelength for a particular element is shone through the flame, and some of this light is absorbed by the atoms of the sample. The amount of light absorbed is proportional to the concentration of the element in the solution, and hence in the original object (Fig36.6). Measurements are made separately for each element ofinterest in turn to achieve a complete analysis of an object, and thus the technique is relatively slow to use. However, it is very sensitive and it can measure trace elements down to the part per million level, as well as being able to measure elements present in minor and major amounts. The equipment is highly complex and can be operated only by trained personnel. The capital cost is prohibitive. Flame AAS techniques are the oldest methods, and they can measure parts-per-million element concentrations with accuracies in the 1–3% range. Graphite furnace AAS, a more recent develop-ment, uses much smaller samples, and can make parts-per-billion measurements with about 20% accuracy. The newest technique, diode laser AAS, can look at several elements in a sample simultaneously using an array of lasers that emit various wavelengths of light. A mathematical process is then used to separate the mixture of light wavelengths that reaches the detector. Inductively Coupled Plasma Atomic Emission Spectroscopy (ICP-AES) is a new development that allowssimultaneous multi-element analysis. Seventeen elements can be measured from a single sample : aluminium, barium, cadmium, chromium, copper, iron, lanthanum, lead, manganese, molybdenum, nickel, platinum, silver, strontium, tin, titanium, and zinc. Table 36.1 gives the comparative status of efficiency of thecommonly used laboratory techniques in toxicology. This is a highly sophisticated and expensive method of detec-tion of a variety of inorganic elements at levels well below the limits of conventional analytical techniques. The sensitivity attained is remarkable—sometimes 100 or even 1000 times better than by any other method. It is based on the principle that many substances become radioactive when exposed to bombardment by neutrons. The induced radioactivity is highly specific of the elements contributing to it. Consequently, a study of this radioactivity permits identification and quantitative estimation of many elements. Radioactivity is a spontaneous disintegration of the atomic nucleus. It occurs in a number of naturally occurring elements including radium, uranium, and thorium. Radioactive varieties (isotopes) of all other elements may be made artificially as explained above, by exposing them to bombardment by neutrons. However this requires the use of a nuclear reactor, though attack by charged particles such as protons and deuterons obtained from high energy accelerators may also be serviceable. Assay of the induced radioactivity can be done by means of either a Geiger counter or a scintil-lation counter. Neutron activation analysis is a sensitive analytical tech-nique useful for performing both qualitative and quantitative multi-element analysis of major, minor, and trace elements in samples from almost every conceivable field of scientific or technical interest. For many elements and applications, NAA offers sensitivities that are superior to those attainable by other methods, on the order of parts per billion or better. In addition, because of its accuracy and reliability, NAA is gener-ally recognised as the “referee method” of choice when new procedures are being developed or when other methods yield results that do not agree. Worldwide application of NAA is sowidespread it is estimated that approximately 100,000 samples undergo analysis each year. Neutron activation analysis can be used for the estimation of any of the 90 naturally occurring elements including antimony, arsenic, cadmium, copper, iron, lead, mercury, selenium, thallium, and zinc.